We were up bright and early the next morning. I awoke first and went for a soak in our private outdoor hot tub. Lying back in the deliciously hot water, feeling the early-morning chill on my arms and peeking out past a screen of thin woven wood for a glimpse of the mountains rearing up into the perfect azure skyline in the distance was invigorating enough to dislodge any vestigial cobwebs from the previous day’s entertainment. My companions were stirring as I returned to the room. It was way too early for breakfast so we sat and chatted over innumerable cups of green tea before performing our ablutions and dressing for breakfast. Our morning repast was in the same communal dining room where the previous evening’s action had taken place, but we found it strangely transformed, with screens pulled back to let the morning light stream in and a hypnotic, dreamlike form of Japanese ambient music twinkling in the background. An hour later, the combination of a late night, a many-coursed breakfast and the addling effects of the Möbius strip of structureless xylophonic harmony had overwhelmed more than one of the group. Rousing ourselves with great effort from our torpor, we packed, said farewell to our gracious hosts and posed for pictures outside the ryokan before heading onto the battle bus and setting forth on the next leg of our adventure. 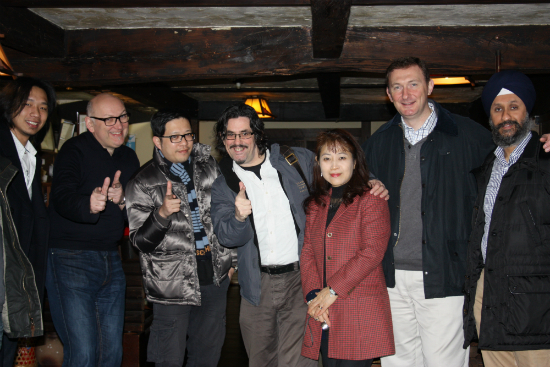 Perhaps inadvisably, our morning appointment was at Akuto-san’s family sake brewery, but we were made of sterner stuff. We weren’t afraid. Breakfast had sunk in by the time we arrived, so it was with an air of excited curiousity that we stepped off the bus in Chichibu itself (the distillery we’d visited the day before is a mile or two outside the town) and headed into what seemed to be a traditional Japanese house on a normal street in a typical mountain town. We entered and found ourselves in a dimly-lit but otherwise very normal shop festooned with bottles all covered in labels with traditional kanji characters – the only incongruous element was an enormous iron safe on the back wall that looked about a hundred years old. As we paused briefly to admire the safe and an old wooden plaque decorated with Shinto blessings above a doorway at the rear of the shop, Akuto-san arrived and guided us through a courtyard towards a modern concrete-floored warehouse at the back of the property. 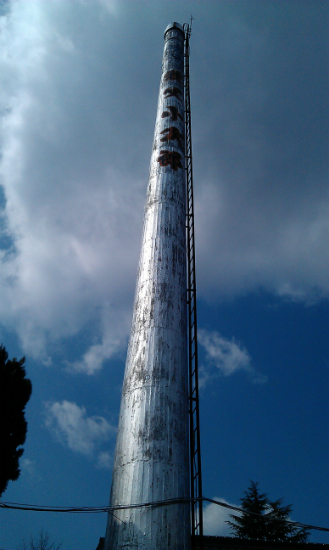 On our left an enormously tall, thin chimney decorated with silver paint and more kanji rose above us, and we passed under a small Shinto shrine as we entered the warehouse. By now I should have been used to these fusions of religious tradition and modern manufacturing processes, but it still struck me as strange at first. But only for a moment – after all, Akuto-san’s family have been making sake here for centuries (since 1675, in fact – the brewery has been in the family for 21 generations). It was just my topsy-turvy gaijin outlook that made me think anything was strange, when in fact the only thing out of the ordinary was ourselves. After a brief guided tour of the brewery, and an explanation of the sake-brewing process (more later) we strolled through another warehouse adjacent to the main plant on our way back round to the entrance. This was evidently used as a storage area and was dotted with spare equipment and large plastic tubs of unidentified stuff. Towards the back of this space we encountered a rather stumpy, old-looking still squatting by the rear exit. Although it looked a little dusty and disreputable, it was fitted with a condenser and had a small set of metal steps up the side. Was Akuto-san going to be making whisky here as well? Remarkably, it transpired that this was one of the original spirit stills from Hanyu, the distillery set up by Akuto-san’s grandfather. 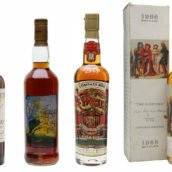 It had been rescued from the distillery site when the original company went out of business at the turn of the millennium and now here it was in the corner of the brewery’s warehouses in Chichibu. Even more amazingly, the still had been resurrected and put to work making shochu from both sweet potatoes and rice, which, after a short period of ageing, will be used to fortify some of the family’s Daiginjo and Honjozo sakes. This sensational news was revealed without fanfare (and indeed only under close questioning on our behalf by David Kroll’s wife Noriko) in Akuto-san’s traditionally modest style. 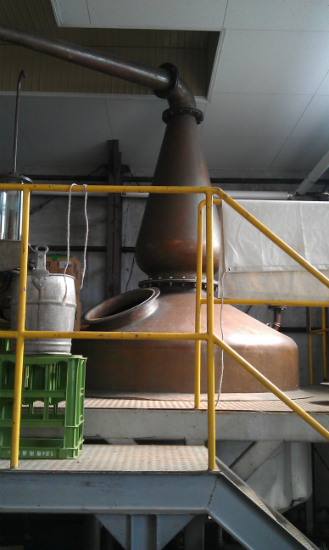 He seemed quietly amused at the thrill it gave us to be in the presence of a fascinating relic of Japanese distilling history, and the joy we felt that it had miraculously been reincarnated and put to good use. It was now around 11am, so with the tour completed it was time to drink some sake. For the uninitiated I will try to explain a bit about sake, but I’m far from an expert, so apologies to any sake geeks out there if I’ve made any mistakes. Although sake is often referred to as ‘rice wine’ this is something of a misnomer. In fact, the process of making sake is more akin to beermaking: sake is not vinified, it is brewed via the conversion of starch to sugar (a process known as ‘saccharification’) and the fermentation of those sugars by yeast to convert them into alcohol. Apart from the raw materials, the major difference between making beer (or a wash for whisky) and making sake is that where beer is made by converting the starches to sugar and then fermenting the resulting wort, in sake the conversion and fermentation occur at the same time or, to be more precise, during the same process. In sake the raw material is rice rather than barley, but like barley it has a hard outer shell or husk that needs to be milled or ‘polished’ to let the conversion agents at the starch / sugars inside. The more polishing you do, the more of the husk you remove, the smaller your rice will be, the larger proportion of pure starch you have and the better (and more expensive) your sake will be. In beer the starch->sugar conversion is done by enzymes produced during the malting process; in sake the necessary enzymes are not produced in the rice by the initial steeping and cooking stages, so the enzymes are delivered in a different way: by the addition of a mould (Aspergillus oryzae) which grows on the freshly-steamed rice over a period of about a week. This moulded rice is known as koji and is added to more freshly steamed rice, plus yeast and water and left another week or so for further fermentation. This initial mash is called the yeast starter. When the yeast starter is ready, more koji, water and freshly-steamed rice are added in stages and the mash is left to ferment for up to a month (Akuto-san’s sake is fermented for 30 days at a very low temperature in bamboo-insulated tanks). The addition of each ingredient is kept strictly in proportion so that the koji can produce enough sugars at the correct rate to keep the yeast growing. This process is known as multiple parallel fermentation and in effect means that both the conversion processes (starch to sugar and sugar to alcohol) are occurring simultaneously in the same tank. When the fermentation is finished, the sake is extracted from the rice by pressing and is then (usually) filtered before maturation and bottling. 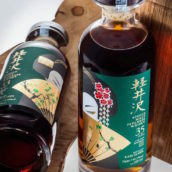 Most low-grade table sakes (Futsu-shu) and some special designation high-grade sakes are fortified with spirit before being reduced to the desired strength and bottled. 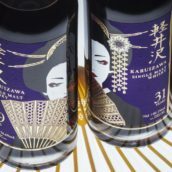 Special designation sakes are known collectively as Tokutei Meisho, and must conform to certain regulations with regards to production methods – a little like an Appellation Contrôlée system. The only Tokutei Meisho sake styles that can be fortified are Ginjo, Daiginjo and Honjozo, and the amount of added alcohol must be less than 10% of the weight of the rice used (after polishing). We started with Nigori, a cloudy, sweet, frizzante unfiltered sake that tasted of strawberries and lychees – indeed, those two flavours cropped up a few times as we went through the tasting. As you’d expect, Akuto-san’s family sake is all about quality – all the sake we tasted apart from the Nigori was Tokutei Meisho. We moved onto the Honjozo, a style of fortified Tokutei Meisho sake that has been polished to 60%. 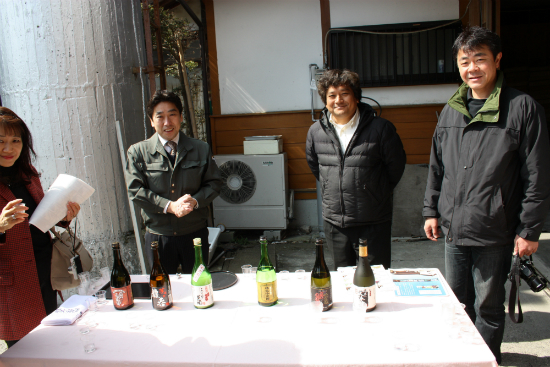 At Akuto-san’s brewery they use their own shochu that has been aged a couple of years for fortification. This was quite sweet and yeasty, with a pleasing creamy texture. Next up was a Daiginjo, another fortified Tokutei Meisho sake where the rice must be polished down to 50% or less. Akuto-san’s rice for this sake is polished further, to about 40%, and the result is a fantastically fresh, clean summer fruit style. This was my favourite of the tasting, closely followed by the last sake we tried, a Junmai Daiginjo which also has to be polished to less than 50%, but which is not fortified. Again, this was very, very clean and fresh in style, with amazingly more-ish lychee and fresh strawberry notes. We then moved on to a couple of the Shochus from the Hanyu still. This was obviously very exciting. For their rice shochus, the brewery makes a special type of sake which is distilled to 40% and subsequently diluted to 25% before bottling. 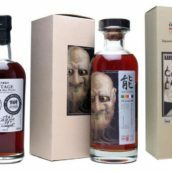 Unsurprisingly, then, the nose and palate on the rice shochu was very much akin to diluted new make spirit, with a certain earthy, grappa-esque quality. Finally, we came to the sweet potato shochu, which was very enjoyable, much fruitier than the rice version. And so we reached the end of this fascinating mid-morning al fresco tasting. Bidding a fond farewell to Akuto-san and the brewery staff, we boarded the battle bus and set off once more into the mountains.